I found the first volume of this series pleasant enough, but I wasn’t sure how well it would measure up to the heights of other Shojo Beat series like Kamisama Kiss or Demon Prince of Momochi House. Reading the second volume of Kakuriyo reminded me that it is always good to give a manga series a couple volumes to settle into itself, and I found some of the mysteries being set up in the second volume broadened the world building a bit more to capture my interest. The volume opens with Aoi stumbling across a Tengu in front of the abandoned cafe that she’s temporarily inhabiting in the spirit world. The elderly man reminds her of her grandfather, and she proceeds to feed him her extra food. As she introduces herself to Lord Matsuba, he realizes that she’s Shiro’s granddaughter and starts laughing with his recollections. He shares some of his memories and goes on his way. The next morning Aoi finds out that she’s stumbled into spirit world diplomatic relations, as Lord Matsuba is extremely powerful. He finds it outrageous that she’s sleeping in a storeroom and cooking, and offers to bring her to his mountain where she can be a bride for one of his sons. He also gifts her with a special fan. Aoi is determined to find her own path and declines his offer, but her worth in the spirit world has definitely increased. The world building in this volume was also entertaining, as Aoi gets a chance to see the spirit world outside of the inn, and meets Suzuran, a geisha who is also the sister of the receptionist. It turns out that Kijin is much more protective towards the people who work for him than Aoi was assuming. She also gets a chance to win over one of her earlier enemies in this volume, again due to the power of her cooking tailored towards the individual. Seeing the world open up a little more in this second volume drew me into the story much more than the first, and I’m intrigued by the references to Aoi’s grandfather and her growing friendship with the fox spirit Ginji, who seems to remind Aoi of her grandfather in mysterious ways. Seeing Aoi’s human ways start to influence the existing relationships between the spirits is interesting, and I’m curious to see how she begins to wield more influence due to her cooking habits and approach to human-spirit world relationships. I still wish the art for this series had a bit more of a unique twist to it, but I enjoyed seeing the airships of the spirit world, the faceless handmaidens who prepare Aoi for an outing, and the continued practices of wearing masks, as Aoi has to hide her human nature when she’s away from the relative safety of the inn. 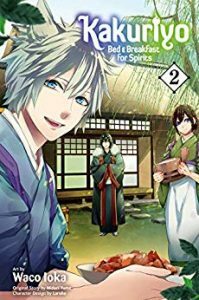 I think I’m starting to see more signs of a deeper story emerge in the second volume of Kakuriyo: Bed and Breakfast for Spirits, so I am curious to see how it unfolds.